About Us: The Friends of Beamish Museum. Finding Out about The Friends of Beamish. Photograph: One of our members in costume talking about the Friends to visitors at the Power from the Past show which is presented each year by the Friends at Beamish Museum. With an alternative description for non graphics or blind users. The Friends, who are affiliated to the British Association of Friends of Museums, govern their own affairs through a Board of Directors which works closely with the Museum staff. Representatives sit on the Joint Committee responsible for the development and management of the Museum. The members are people from all walks of life who want to help the museum grow and to preserve their heritage. They come from all over the country and overseas. We Are a Registered Charity and Limited Company. The Friends Provide Volunteers to Work at the Museum and Outside Events. Some volunteer work is seasonal such as the planting of trees at the Museum. Other occasions arise when extra help is needed for specific tasks such as preparing for an event on site or acting as a marshall at the steam engine rally. If you are able to help I'm sure you will enjoy your day out with the Friends. When volunteers are needed for any Friends' activity a notice will be posted on this website to inform the members with full details of time and place and who to contact. If you would like to receive an email when volunteers are needed for assistance at the Museum or outside events please contact the Projects Director. You can specify the type of assistance you are interested in so that we will only inform you when help is needed in that type of activity. What the Friends' Volunteers Do for the Museum. Many Friends who are able to, and live locally, find great satisfaction in volunteering and using their skills to restore exhibits which have included vehicles, bicycles, engines, music boxes, clocks steamers, farm equipment and tramcars. Others look after administrative work. An increasing number work in costume, helping to interpret the Museum for visitors, and some do promotional work in costume publicising the Museum. There are thriving groups focused on the tramway and on gardening and environmental activities. The Friends' subscriptions pay for some of the restoration, and are used to make purchases for the Museum, the most recent being the SHEW car and replica Chauldron Wagons for the 1820 period area. Volunteers range from teenage to old age, with each seeking the reward of satisfaction in their own way. The Friends attempt to offer opportunities equally to all, consistent with the aims and tasks available. 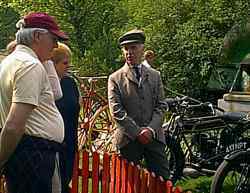 The photograph shows a couple of visitors talking to a man dressed in period costume who is standing amongst a group of vintage cycles and motorcycles. The left quarter of the photograph is taken up by a large man looking towards the centre. He wears a red baseball cap, a white tee shirt and a pair of blue jeans with a brown belt. The man has grey hair and standing with his hands behind his back. To the right of this man almost hidden by him stands a woman with a light coloured short hair style and wearing a blue one piece dress. Centre of the photograph stands a slim man in 1920 style period custume. It is a light brown suit with matching cloth cap, white shirt with a high collar and a black tie that is tied in a large knot. This man is standing looking at the other two figures on the left. He has his hands clasped in front of him. Between this man and the other two people can be seen, in the rear, the shape of old style bicycles not clearly but one appears to be what is known as a bone shaker. Part of a small green fence can be seen between the man and the visitors. The right half of the photograph shows two early motorcycles both black in colour with spoked wheels and number plates with white lettering and numbers. There is also white lining on the fuel tanks and the frames. Right of these a rectangular shaped vehicle coloured grey but indistinguishable can be seen. The background consists totally of green trees and bushes with a speckled effect of white blossom. TEXT.